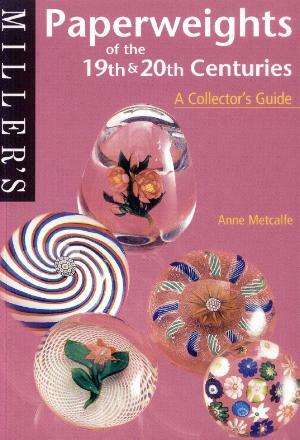 This is a delightful new publication containing a wide range of information about glass paperweights. It provides a comprehensive and enjoyable introduction to the subject of glass paperweights by tracing the development of paperweights from the mid-1800s to the present day. Includes a price guide for every item shown. One nice feature are the Fact Files found throughout the book which highlight the main characteristics of factories and makers. These Fact Files provide a useful quick guide to identification and styles. 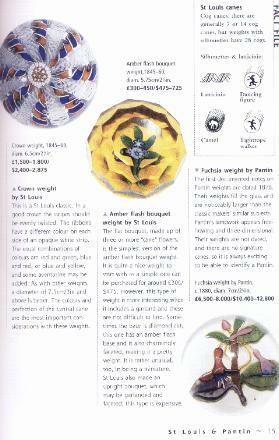 64 pages with over 150 paperweights shown in color. Soft bound. 6" by 8 1/4". 2000.